“Gamma Saow and Gampa Kawuw” came to visit this weekend, and did we ever have a good time. 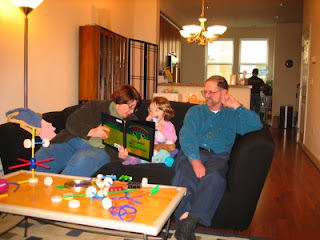 From the very beginning, Elise suckered them into building with Tinker Toys and reading library books. (Quick trivia: Heather used to work at an office housed in the former Tinker Toy factory.) We spent a lot of time playing at home and hanging out at parks. Grandpa Karl has infinite patience for playing in the sand, and Grandma Char knows how to do cool craft projects. After we left the grandparents at the airport this morning, Elise said, “Maybe we can see them tomorrow.” When Mommy explained that Grandma and Grandpa were on their way home to Montana, Elise burst out with, “I don’t want to miss them goodbye! !” We stopped at our favorite coffee shop and had a scone while we talked things over. Between having Grandma Judy here from Pennsylvania a few weeks ago and having the Schmiedeskamp grandparents here this weekend, Elise has been enjoying a lot of grandparental attention. It’s going to be an adjustment getting back to “regular” life.